In the year 1963 a little whitewashed summer cottage with its surrounding coconut grove was inherited by Aires Dias. He made his father's dream of "Cottages By The Sea" into what is today the resort PRAINHA, which centres around the original cottage. The name derives from the Portuguese word for 'little beach'. Prainha is the perfect setting for an exotic holiday. Though only seven kilometres from the city of Panjim, it is distant from the clamour and the sights of the typical tourist spots. It overlooks the secluded Dona Paula beach and is surrounded by tropical vegetation and tall palm trees. Its simple offerings, the vibrant colours of the Goan landscape, the seaside, the fragrance of country flowers, waves lapping on a little used beach, home cooked meals with a professional touch, spacious rooms and cottages, make staying at Prainha an unforgettable vacation experience. Our staff, brought up on a tradition of simple and honest values, will work their way into your heart, with their smiling eagerness to please you in every way. 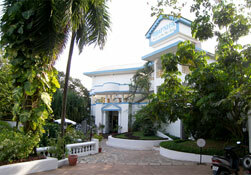 Our rooms have been designed to reflect the relaxed, easy-going life style of Goa. The rooms at the resorts are done up in plush décor and are adorned with state of the art facilities along with a fabulous view of the sea. The Prainha Beachside Cottages offers modern business facilities like STD/ISD, fax, internet connectivity. The conference hall at the hotel is fit for formal banquets, receptions and corporate conferences. The Prainha is the place where you can surprise your friends with a lavish party at this exotic location or convene a business meeting. Dona Paula Beach is famous for the legend of Dona Paula Menezes, the daughter of a viceroy in the colonial period who killed herself by jumping off a cliff at this place because her family disapproved of her affair with a local fisherman named Gasper Dias.